John Goodman and Billy Crystal will reprise their roles as Sully and Mike Wazowski for Monsters at Work, a new animated Monsters, Inc. spinoff series set to debut on the Disney+ streaming service in 2020. The series picks up six months after the original film ended. The narrative follows Tylor Tuskmon (Ben Feldman), an eager and talented mechanic on the Monsters, Inc. Facilities Team who dreams of working on the Laugh Floor alongside Mike and Sully. Other returning cast members are John Ratzenberger as Yeti, Jennifer Tilly as Celia, and Bob Peterson as Roz. New cast members include Kelly Marie Tran and Henry Winkler. 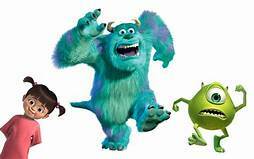 The original Pixar film was released in 2001 and was followed by a prequel, Monsters Unviersity, released in 2013. The “Monsters Inc. Mike and Sully to the Rescue” still entertains visitors in Disney California Adventure, despite previous rumors it might be closed.